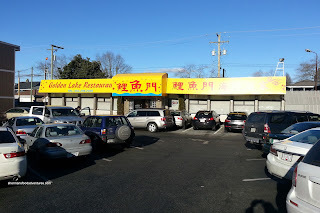 Although Golden Lake is fairly accessible in terms of distance from my house, I seem to travel farther for Dim Sum. Unlike my recent re-visit to Yan's Palace, there was also not much motivation to stop in at Golden Lake, until now. Apparently, they have changed ownership (hence the new awning) and have revamped some of the menu. They have added some "Chef Tony-esque"-type of offerings to their Dim Sum service. With that in mind, we had an impromptu visit one Sunday morning. 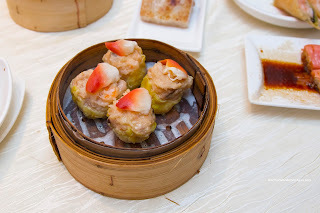 Getting right to the "new" items, we tried their Siu Mai with Surf Clam (pork and shrimp dumplings). As much as the surf clam added a new twist on presentation, it did little to enhance the dumpling. 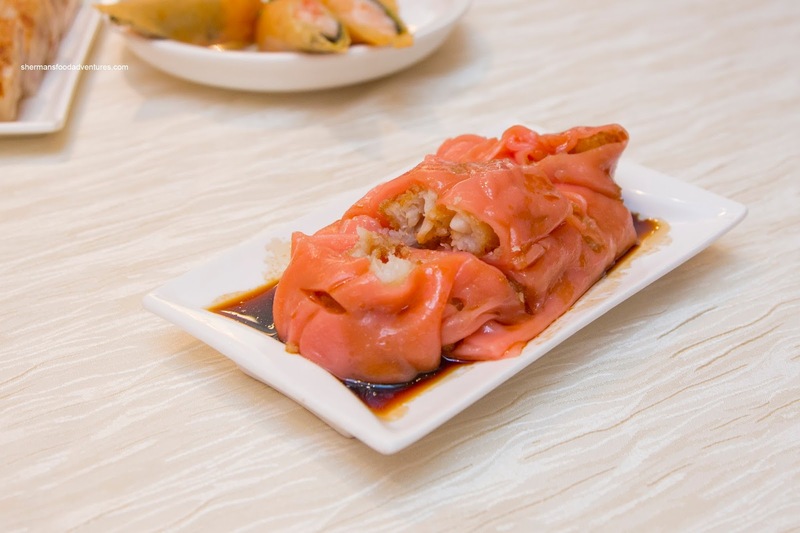 In fact, since it was steamed for the same amount of time as the pork and shrimp, it became rubbery. The dumpling itself was good though with more whole shrimp (meaty snap texture) than pork (more as a binding agent being bouncy and mousse-like). We found the taste to be rather bland though with only a bit of sweetness. 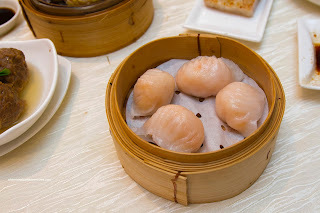 The same could be said for the Haw Gow (shrimp dumplings) as there was little seasoning for the whole shrimp (also exhibiting a meaty and firm snap). 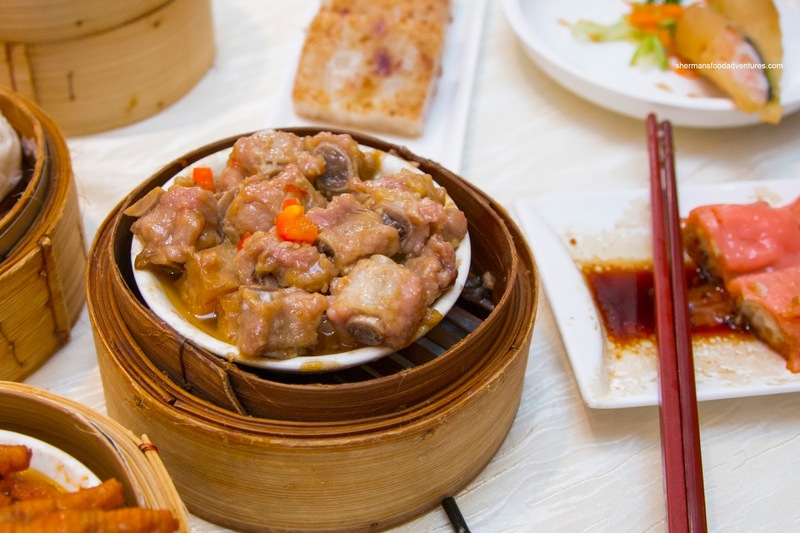 A touch floury and lacking elasticity, the dumpling skin was also a bit thick. 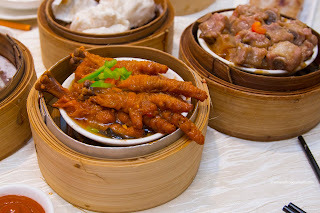 Moving onto more standard items, we had the unappealing-to-look-at Phoenix Talons (chicken feet). With unattached skin and generally disheveled appearance, it didn't look all that appetizing. Although it ate better than it looked, the skin was too soft while the cartilage and tendon underneath were somewhat melted. Furthermore, other than some garlic notes, the dish was underseaoned. Continuing with the underseasoned trend, the Steamed Spareribs with taro lacked punch. Again, there was some garlickiness, but other than that, we could really taste the pork. Texturally, it was on point with nice rebound and easy on the fat and cartilage. They could've eased up on the starch though as it was goopy. Served in a broth and topped with 2 pea shoots, the Beef Meatballs featured barely any green onion. As such, the flavour profile was a natural tasting beefiness. 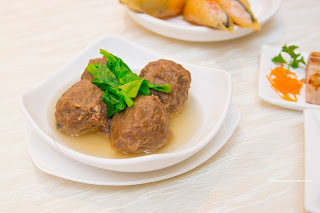 In fact, other than a modest rebound from the meatball, there was a certain amount of real beef texture. Once again, they were pretty conservative with the salt as we really needed the accompanying Worcestershire sauce. 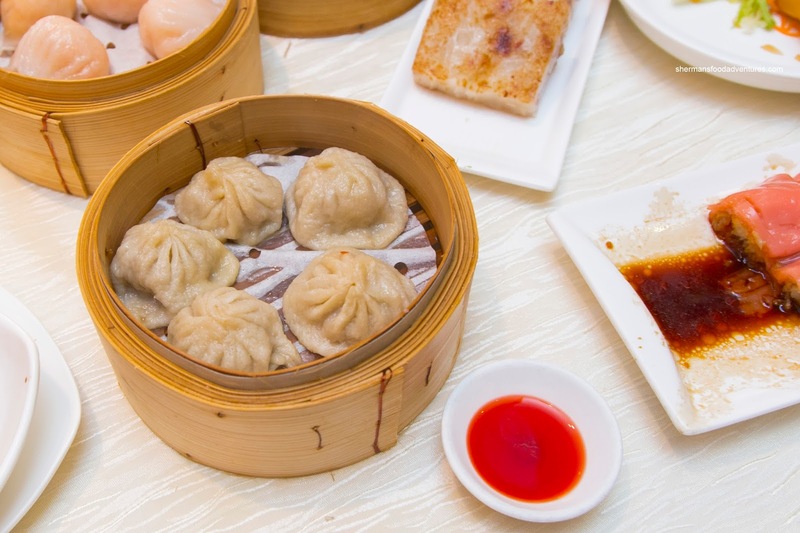 Okay, we were pretty much expecting the Xiao Long Bao to be average at best (since Cantonese Dim Sum rarely yields a good version), however, these were below average. Featuring a thick and doughy skin, the rest of the dumpling was subpar. There was no soup to be seen and the meat filling was inexplicably spiked with dried orange peel. Back to the more interesting dishes, we had the Fried Fish Rice Noodle Roll sporting a shade of pinkish-red. Inside, it consisted of a considerable amount of fried basa. Hence, it ate more heavy than the usual shrimp or pork version. With that being said, the fish was still flaky and soft while the rice noodle was thin and sported the right elasticity. 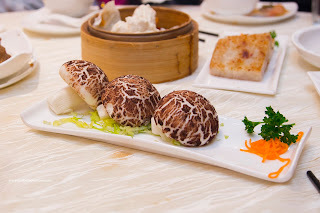 The most interesting item we had was the whimsical Steamed Mushroom Buns shaped like large shiitakes. 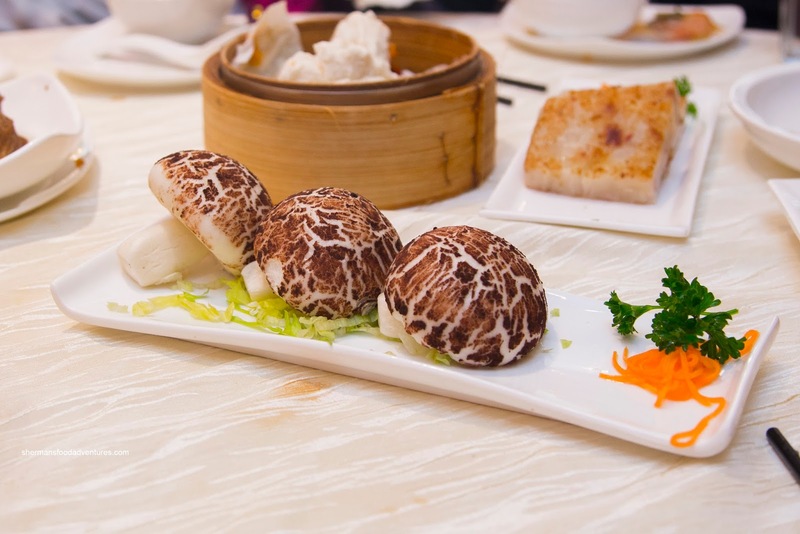 Inside the soft and fluffy buns, there was an array of impactful and woodsy mushrooms. We loved the creativity and presentation of this dish even though the filling could've used some more salt. Of course my son reminded us that we had to order the Shrimp Spring Rolls, but to his chagrin, they also included a layer of seaweed. We reminded him that he has had this before on a prior visit and he ended up eating it anyways (phew...). 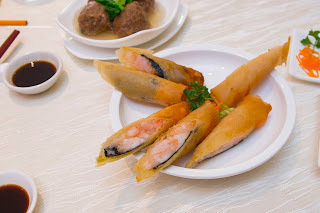 Similar to the haw gow, the spring rolls were filled with whole shrimp sporting the same meaty snap. We liked how they were crunchy while easy on the grease. 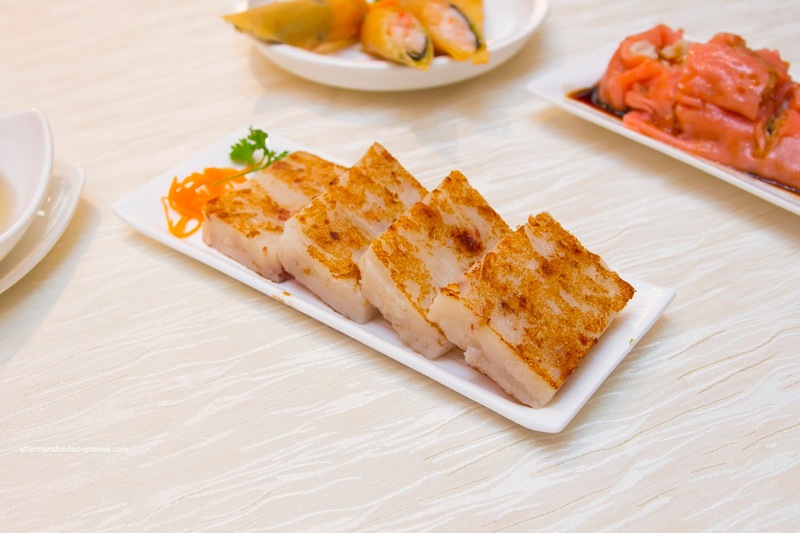 We were not sure why we ordered the Pan-Fried Daikon Pudding Cake because we never finish it (and the kids are indifferent with the dish). Well, we didn't finish it despite being a nice soft and smooth texture. On the other hand, this was woefully bland and could've used a more aggressive sear. 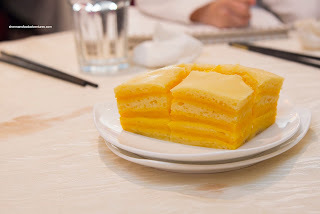 We ended things off with the Steamed Thousand-Layer Cake featuring salted duck egg yolk custard. Although a bit wet, the sponge cake portion was soft and fluffy while easy on the sugar. The duck egg yolk custard was sweet and aromatic which helped balance the cake in terms of flavour and texture. So this revisit to Golden Lake reiterated what I've said before about the place - decent albeit a bit pricey. We did like their attempts to offer something a bit different than the regular with varying degrees of success.